Why: Sudan 2010 is Sudan on the Brink. With elections in April and the all-important referendum only a year away, 2010 could see Sudan explode, with the world as spectator. The genocide in Darfur continues, and violence is rising alarmingly in the South. The Khartoum Government ignores its commitments, beating and jailing the opposition and making a sham of the upcoming elections, elections which are partially funded by our own tax dollars. It is time for us to stand with the people of Sudan. We will light a fire and make noise and sustain, demanding that our leaders work to impose immediate pressure and sanctions on President al-Bashir’s government. Peace, Protection, and Justice for Sudan Now! Our rally is part of Sudan365 – A Beat for Peace. Thousands of activists will gather in 13 countries to warn of worsening conflict in Sudan. Sudan365, a year of campaigning for Sudan, has been organized by a coalition of group. The effort comes with one year remaining until a referendum that will decide the future of Sudan and marks the five year anniversary of the Comprehensive Peace Agreement that ended the civil war between Northern and Southern Sudan and called for this referendum. With many highly contentious issues still to be resolved and amidst increasing inter-ethnic violence in the South and continued attacks on civilians in Darfur, there is a real risk of a return to conflict that could destabilize the entire region and place civilians in grave danger. Download this FLYER. Pass it out or post it in your community! 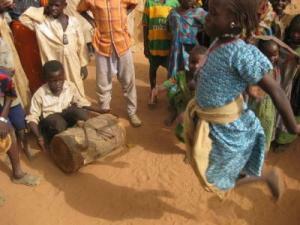 To find an event in the United States visit the Save Darfur Coalition events calendar.